Ever since Voyager 2 beamed home spectacular images of the planets in the 1980s, planet-lovers have been hooked on extra-terrestrial aurorae. Aurorae are caused by streams of charged particles like electrons, that come from various origins such as solar winds, the planetary ionosphere, and moon volcanism. They become caught in powerful magnetic fields and are channelled into the upper atmosphere, where their interactions with gas particles, such as oxygen or nitrogen, set off spectacular bursts of light. 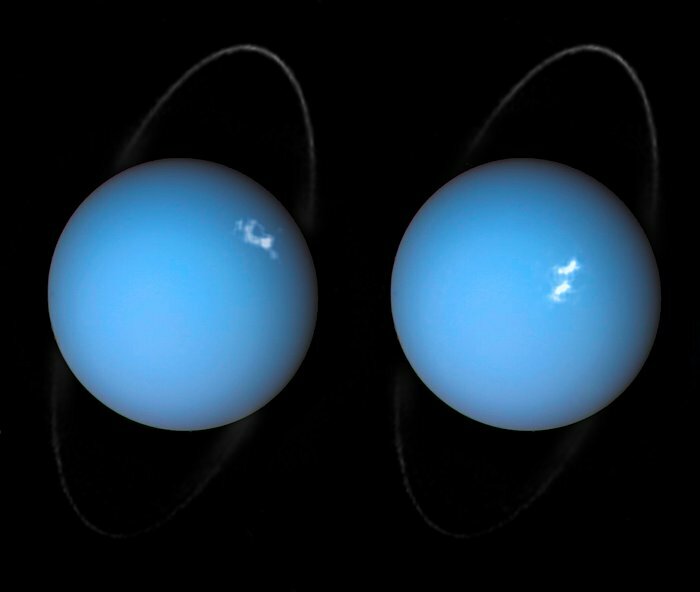 The alien aurorae on Jupiter and Saturn are well-studied, but not much is known about the aurorae of the giant ice planet Uranus. 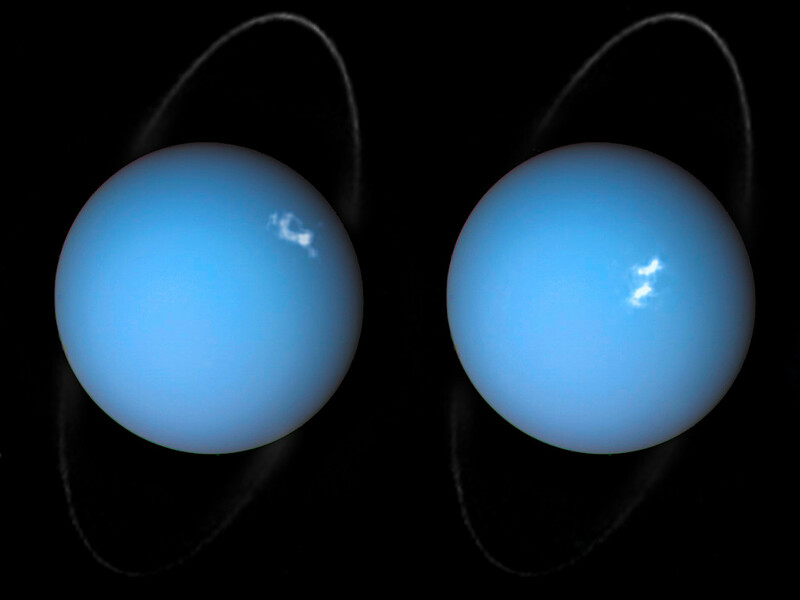 In 2011, the NASA/ESA Hubble Space Telescope became the first Earth-based telescope to snap an image of the aurorae on Uranus. In 2012 and 2014 a team led by an astronomer from Paris Observatory took a second look at the aurorae using the ultraviolet capabilities of the Space Telescope Imaging Spectrograph (STIS) installed on Hubble. 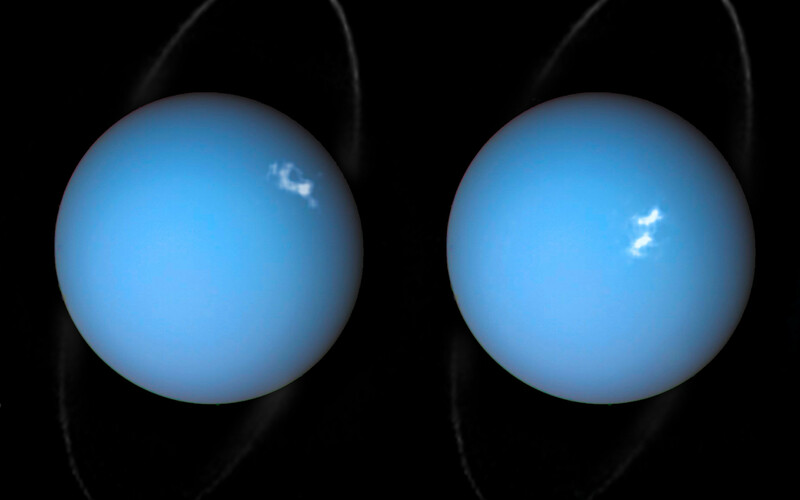 They tracked the interplanetary shocks caused by two powerful bursts of solar wind travelling from the Sun to Uranus, then used Hubble to capture their effect on Uranus’ aurorae — and found themselves observing the most intense aurorae ever seen on the planet. By watching the aurorae over time, they collected the first direct evidence that these powerful shimmering regions rotate with the planet. They also re-discovered Uranus’ long-lost magnetic poles, which were lost shortly after their discovery by Voyager 2 in 1986 due to uncertainties in measurements and the featureless planet surface. This is a composite image of Uranus by Voyager 2 and two different observations made by Hubble — one for the ring and one for the aurorae.